I present my Simpson build!! Made of ABS and with an aluminum extrusion-based triangular base! Not yet wired up, but will be hopefully soon. Any ideas for a name? I can't think of one at the moment, but I just had to post the pic. That is a mighty fine looking machine. 5 stars. That IS a good looking design, rather like the Kossel base - Gossel ? Gussel ? What are you going to print on. I will probably end up putting an aluminum sheet on top of those extrusions for printing. I've had great success using wire-wound power resistors JB-welded to the underside of aluminum sheets for a heated bed. I just attach them to mains and use a solid state relay to control. Quite professional, I like it. Though the printer's goal was to not use really specialized materials, using them anyway sure does look good on it. Feign wrote: Though the printer's goal was to not use really specialized materials. I don't think that a metal bar is that specialized. It could be made from aluminum or steel angles or hollow square tubes, or for that matter just replace the top and bottom aluminum extrusions with 3 plywood side boards around the outside. The basic idea of doing a frame rather than a plate can have a lot of DIY alternatives without buying specialized parts. I like it too. The problem with the current printer design is it requires two precision cut triangular plates, which is pretty hard to do by hand. Some people have said they can do it with laser cutting or water jet cutting, which is antithetical to the premise of a reprap in my opinion. Aluminum extrusions can be cut with a hacksaw, and you can get the exact right triangular shape just by sliding the extrusions in and out before fixing them in place. In the future it would be better to replace the extrusions with something you can actually get at the hardware store. Maybe some U-shaped aluminum framing could serve the same purpose. I know I have seen those for sale at the hardware store. Why do you think that you need precision cut triangular plates, and why two of them? I grant that it might look nicer, but I believe that the machine would work happily with imprecise hexagons mounted on the rails. Another choice is to look for a spring-form cake tin with a tempered glass base, on Ebay. A 8" or 9" tin should be less than $20. Throw the tin away and glue your heating coils to the glass and you have a cheap heated bed. Use clips to mount it to the top rails and you are done. 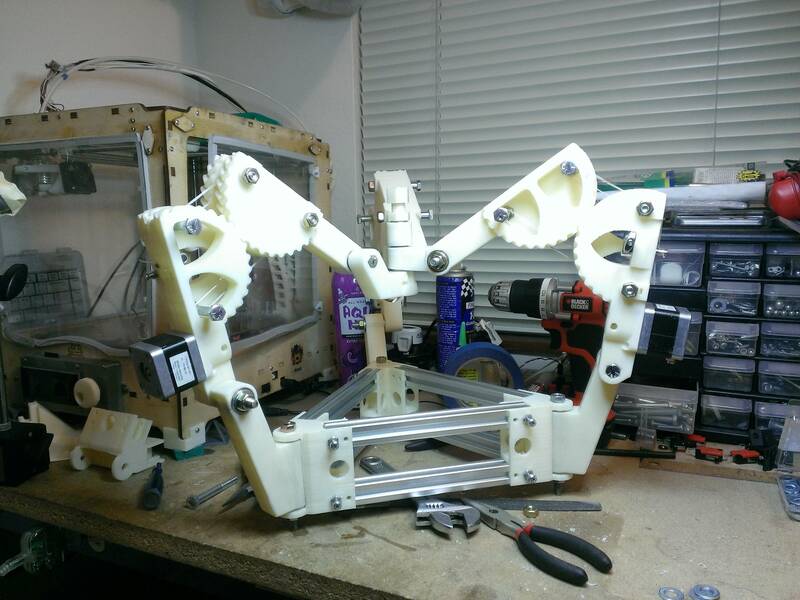 Fundamentally, the top of the base looks like a Kossel and so you can use their designs for a bed. It is a very simple matter to drill 3 equidistant holes in a plate. (Use a compass for layout.) You can do both plates at the same time. (Screw them together.) Everthing besides the holes doesn't need to be accurate.